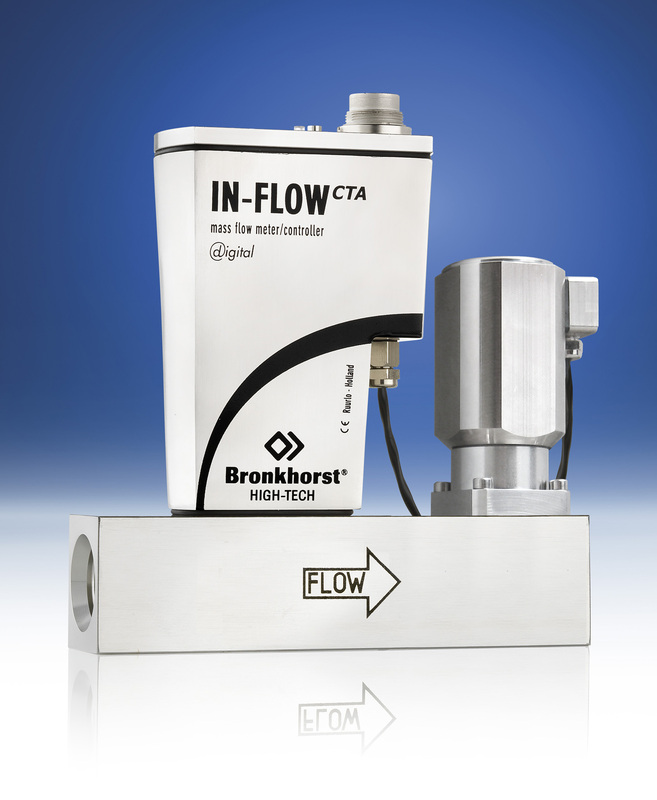 With the introduction of their new model T23, Bronkhorst High-Tech expands its IN-FLOWCTA series of mass flow meters/controller for industrial applications. These instruments work on the basis of direct through-flow measurement (no by-pass), following the constant temperature anemometry principle. The instruments contain no moving parts and have no obstructions to the flow path, which makes them suitable for low pressure drop applications and less sensitive to moisture or particulates than thermal mass flow devices with by-pass sensor. The electronics housing is of rugged design according IP65 (dust- and waterproof). The flow meters and controllers are available with optional ATEX approval for use in Category 3, Zone 2 hazardous areas. The T23 is a compact mass flow controller with a newly-developed integrated, direct operating valve that can cope with high gas flow rates. The maximum flow control range of the instrument is 12-600ln/min. Both analogue I/O-signals and RS232 connection are available as a standard feature. In addition to this there is the possibility of integrating an interface board with DeviceNet, PROFIBUS DP, Modbus or FLOW-BUS protocol. Applications can be found in process control systems as for example in food, chemical and petrochemical plants.